First review of the year, I’m going to attempt around a dozen this year and I’m starting with a superb blend from Waitrose. 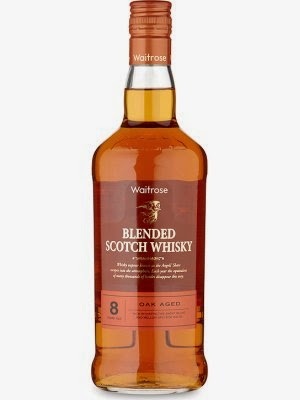 The Waitrose 8 year blended Scotch Whisky is a mixture Islay and Speyside Single Malts as well as aged grain whisky. Nose: First thing you get when you open the bottle is a blast of hot smoke that over powers everything else, the curse of adding anything from Islay but after leaving it in the glass for a few minutes and giving it a couple of swirls I also get fresh plastic packaging, honey, dried apricots and a tiny hint of cut grass, very pleasant indeed. Adding a little water brings out the Speyside elements even more, honey, fruits and wet grass all spring to mind. Palate: Smoke and cut grass come first, lovely and warm, quite simplistic for what is essentially a sub twenty pound bottle of whisky. Add a little water and you get some nice seaweed and herbal notes, like if Talikser had a lot of Speyside added, add a drop more water and I get candy floss and blackberries but still with a little whisp of smoke in the background. Finish: Smokey and warm but with honey and those dried fruits again. All in all a worthy whisky to start the year off and well worth buying if you have a Waitrose nearby.